Essentially Felt encompasses a fine yarn shop offering couture hand knitting yarns and notions as well as a felting studio offering unique hand felted wearable art. Wed. 1-9 p.m., Thurs, Fri. and Sat. 10 a.m. – 5 p.m. 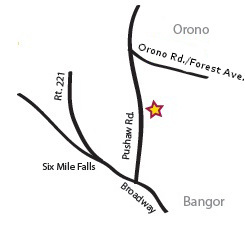 Essentially Felt Studio & Fine Yarn is located at 865 Pushaw Road, Glenburn— just at the edge of the city of Bangor. Unique felt creations by Sandy Spiller.